Being a single young woman, I have plenty of spare time on my hands once Spud is in bed and during my spare time you can catch me doing one of two things, writing or watching films. I am a big film lover, with over 300 DVD's in our household, none that can ever be re-homed or thrown away, I am always happy to receive a new DVD to add to my collection and to tick another movie off my 'to watch list'. When The Big Wedding arrived a few days ago, I contemplated on calling a few of my girly friends, getting the face mask out and getting the bags of chocolate in, I decided against and planned to watch the DVD alone. Stocking up on my supplies, Revels, a bottle of Dr Pepper, some cookies'n'cream Haagen Dazs icecream, all that was left to do was to put on my favourite peel off face mask, sit back, relax and enjoy the show! With some well known actors starring in the film such as Robert De Niro, Diane Keaton, Robin Williams, Katherine Heigl (well known from the popular show Grey's Anatomy -I'm a big fan! ), Ben Barnes, Amanda Seyfried and loads more. When Alejandro (Ben Barnes) prepares to marry his fiancée Milly (Amanda Seyfried) he is forced to lie to his birth mother. Alejandro was adopted & raised by Ellie (Diane Keaton) and Don (Robert De Niro) who have both move on separately in life. Flying half way across the world to watch her son Alejandro marry Milly, Alejandro is faced with a huge problem, his birth mother. Madonna (Patricia Rae) - Alejandro's birth mother is a strict Catholic who believes divorce is a sin. Knowing his birth mother is attending his wedding, Alejandro ask his adoptive parents to pretend they are still married, so the ex husband and wife move back in together for the duration of the wedding weekend. Walking in to Don and his partner Bebe (Susan Sarandon) just about to get steamy, Ellie feels humiliated and doesn't know where to look. You can tell right from the very beginning the film is going to be explosive and full of surprises. With details being thrown in about each character from Alejandro's family, the viewer can be shocked to hear and see secrets never expected. To see a preview of The Big Wedding, check out the clip below! With a certificate of 15 (and rated that for a very good reason!) The Big Wedding is available to buy from all good DVD retailers on both DVD and Blu-Ray for a suggested RRP of £15.99 on 14th of October. 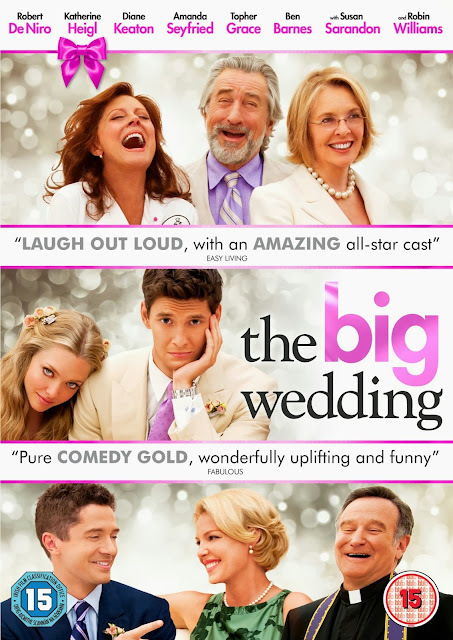 The film also features the making of the big wedding.